As with all the audio products we review here at APH Networks, it takes quite a bit of experience and training of the ears before we can begin making a fair judgment. Even for the best of audiophiles, it can be hard to produce an exact and accurate evaluation of a product without a thoroughly familiar product to use as simultaneous reference. While I will not claim to be the reviewer of all reviewers for headphones, I can say quite a few other computer review sites have editors lacking in training for reviewing anything audio related. Give them anything and all you will get is some vague description of “awesome bass, amazing midrange, nice treble, no muffles, 10/10”. Do not get me wrong though; there are knowledgeable audio reviewers out there on respected online media outlets, but they are far and few. There are no true objective measurements for audio sound quality. 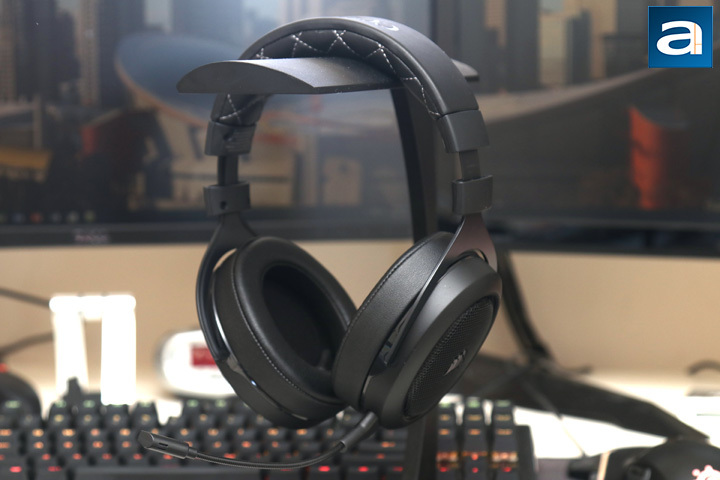 As the reviewer, however, I will put the Corsair Gaming HS70 Wireless through a series of subjective tests to try to come up with the most objective rating as possible. The tests were conducted with the HS70 plugged into my front panel USB port via the included USB wireless sound adapter. After over 50 hours of break-in time (Well above the typical required period), we put the Corsair Gaming HS70 Wireless to the tests. All tracks are uncompressed CDs, FLAC, or LAME encoded MP3s at 192kbps or higher. For gaming, I played Overwatch, League of Legends, and Fortnite Battle Royale. First-person shooter games are probably the most crucial games to test these headphones, as gameplay can heavily rely on hearing additional sounds. The other games have aspects where audio is useful, but this is less of a factor. At the lowest end of the frequencies, the Corsair Gaming HS70 Wireless had decent bass in both amplitude and quality. The low-end was not overwhelming, which is an unfortunate trend with some other gaming headsets. Low end instruments like the bass guitar and drums were reproduced with a good rounded oomph; with depth, tightness, and fullness. In first person shooters, I was able to hear sounds like footsteps and explosions easily. This is especially important in Overwatch, as there are several different paths to the same place, so knowing the whereabouts of your team and your enemies is very important. It is also really helpful for the same reasons in battle royale games like Fortnite. In the midrange, we had a good sound, though it was recessed compared to other frequencies. Vocals, acoustic and electric guitars, and pianos came through clearly, though they felt drier, especially near the higher end of this middle portion. Resonance still was mostly natural, especially in the resonating sounds of pianos and guitars. Along with the slight dryness, midrange vocals lacked a bit of warmth. The midrange performance was reflected in games through voice lines, firing weapons, and weapon reloading. Once again, voices also play a role in games like Overwatch, as you can tell when users are using their ultimate abilities, which tells you either to hide or go towards, depending on the situation. At the upper end of the audible frequency, the Corsair Gaming HS70 Wireless had similar small issues we saw from the last Corsair headset. High-hat clashes and higher-range instruments like violins were clear, but rolled off near the highest end of the treble. The dryness felt in the higher midrange continued here, as the treble felt almost too sharp at times. In games, the higher frequencies can be heard through things like glass breaking. In terms of overall balance, the Corsair Gaming HS70 Gaming follows the similar V-shaped characteristic. With its sufficient bass and treble combined with a lesser midrange, this characteristic is pretty common for gaming headsets. While audiophiles may prefer a flatter response for a more neutral sound, I think the V-shape is actually desirable for gaming, so it is not too surprising here. While testing this headset, the headset's soundstaging capabilities were decent. Overall, it provided an ample amount of depth and direction. This follows again in the similar characteristics as the HS60 Surround, which meant I was more than capable to identify both the distance and location of enemies in my many games of Overwatch. I also tested out the virtual surround capabilities here. While I am used to expecting a distorted audio output, the virtualization from Corsair actually was not too bad. It is still a given you should not use this setting for any music consumption still, but it did not distort gaming output too much. Together, all three layers produced a decently detailed sound. The entire audible range was present and relatively clean. In more complicated music, though it never seemed to lose any instruments, some started becoming harder to identify. There also was some muffle and a slight wireless hiss in the output, but this is quite common for wireless headsets. Otherwise, frequency ranges were separated but defined. Transitions between the ranges could have been smoother, though they were acceptable. In gaming situations, this does not matter as much, but it did affect overall audio performance. Sound isolation on the Corsair Gaming HS70 Wireless was good, as it was capable of sealing noise both internally and externally. Using the microphone was pretty good, as it was able to record a clear sound, while reducing external noises such as my mechanical keyboard or my mouse clicks. However, my voice that was recorded sounded a bit nasally and you can tell the recorded low-end was completely cut off. I personally think this is fine for gaming chat and calls, though I would not necessarily use this microphone for other purposes like streaming or recording. Otherwise, the flexibility of the mic was helpful in finding an ideal placement, and the quick mute switch beside the microphone was also handy. As for the wireless capabilities of the HS70 Wireless, Corsair's claims were pretty much on point. I was easily able to get through around sixteen hours of gaming, music, and other mixed usage before needing a recharge. I think it would have been nice to get a bit more battery life out of the headset, though I also understand it would come at a cost of extra weight or more to stuff a bigger battery inside. Charging the headset from completely empty took about two hours, which is pretty standard for this type of device. In addition, the advertised forty feet of range was as expected, as I had to be several rooms away before my headset would start to cut out. There is also very minimal delay, if any, in the wireless latency, which is great to see. Overall, I think Corsair have delivered in the HS70's claims of the wireless capabilities. posted 5 hours and 5 minutes ago, with 1 posts. posted 5 hours and 6 minutes ago, with 2 posts. posted 5 hours and 6 minutes ago, with 8 posts. posted 5 hours and 7 minutes ago, with 7 posts. posted 5 hours and 10 minutes ago, with 15 posts. posted 5 hours and 11 minutes ago, with 59 posts. posted 5 hours and 11 minutes ago, with 14 posts. posted 5 hours and 11 minutes ago, with 11 posts. posted 5 hours and 12 minutes ago, with 11 posts.